The drug discovery process, in which compounds are screened and evaluated for therapeutic use, has resulted in safe and effective therapies for a variety of diseases. However, assessments of new compounds for drug development are notoriously long and costly; they typically span more than a decade and exceed a billion dollars. Furthermore, only a small percentage of candidates actually make it to market. High costs make the development of new drugs a risky endeavor for pharmaceutical companies and consequently may hinder the exploration of new therapeutics. Removing these barriers using new technologies like CRISPR is key to expanding drug discovery. The preclinical stage of drug discovery relies heavily on the ability to manipulate genomes. By altering the sequence or expression of genes, scientists can develop an array of assays to identify disease targets and test therapeutic efficacy. However, the ability to perform genomic manipulations in a fast, accurate, and cost-effective manner has often been limited by technology. Widely used RNA interference (RNAi) screens, for instance, often only partially silence gene expression and are accompanied by a high incidence of off-target effects. First-generation gene-editing tools, such as zinc finger nucleases (ZFNs) and transcription activator-like effector nucleases (TALENs), have enabled complete knockouts but are time-consuming and expensive because they require specialized protein design. 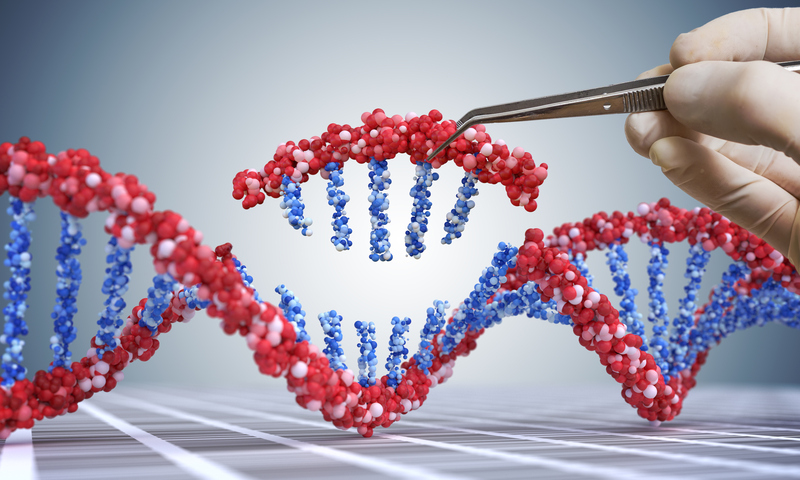 The difficulties posed by RNAi, ZFNs, and TALENs have limited the adoption of genome editing in the drug discovery workflow. This picture is rapidly changing, however, with the recent gene editing innovation: CRISPR (clustered regularly interspaced short palindromic repeats). Composed of only a nuclease (often CRISPR-associated protein 9, or Cas9) and a guide RNA (gRNA), CRISPR systems are much simpler to develop and use than earlier gene editors. By designing a short guide sequence, scientists can target virtually any gene or genetic locus for Cas9 to induce a double-strand break (Figure 1). Figure 1. The CRISPR-Cas9 system comprises a guide RNA (gRNA) and Cas9 nuclease, which together form a ribonucleoprotein (RNP) complex. The presence of a specific protospacer adjacent motif (PAM) in the genomic DNA is required for the gRNA to bind to the target sequence. The Cas9 nuclease then makes a double-strand break in the DNA (denoted by the scissors). Endogenous repair mechanisms triggered by the double-strand break may result in gene knockout via a frameshift mutation or knockin of a desired sequence if a DNA template is present. Subsequent cellular repair facilitates knockouts, knockins, or the exchange of nucleotides. Because these types of modifications are made endogenously, scientists can study the subsequent changes to mRNA and protein at native, physiologically relevant levels. The drug discovery process often starts with basic scientific research and involves many steps before new therapeutics are approved for clinical use. 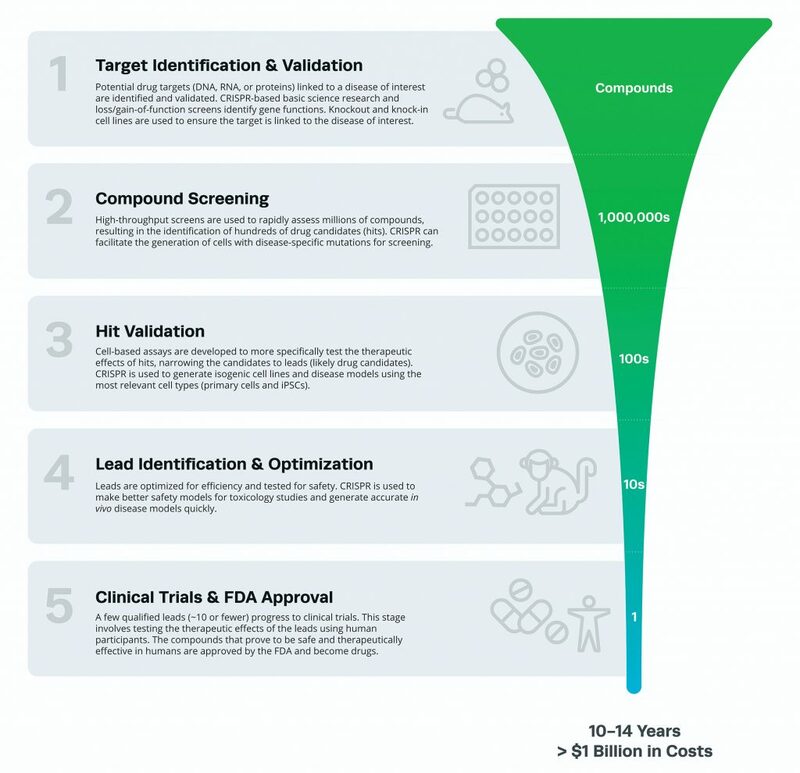 While each pharmaceutical company approaches the discovery and development of new drugs differently, the major steps common to most preclinical processes are target identification and validation, high-throughput compound screening, hit validation, and lead drug candidate optimization (Figure 2). All of these steps, and the ways CRISPR is accelerating progress through them, are discussed below. Figure 2. The drug discovery process begins with preclinical research (steps 1–4). The target of a disease of interest is first identified and validated. A large library of compounds is then screened to identify promising hits that interact with the target. The action of the hits is then validated using cell-based assays. The promising compounds (leads) are then optimized and tested for safety. The remaining candidates continue to clinical trials and, finally, assessment by the FDA (step 5). The process of drug discovery begins with determining a drug target (a gene, an RNA transcript, or a protein) linked to a disease of interest. Putative targets are identified through several avenues of scientific research, often stemming from academia. CRISPR-based high-thoughput screens are commonly used to systematically knockout, inhibit, or activate large numbers of candidate genes. Perturbations that exacerbate or hinder a disease can reveal potential drug targets. Once a putative target is identified, further functional information is collected through in vitro and in vivo studies. CRISPR may aid in these processes by facilitating gene knockouts or protein overexpression in cell lines. If a causative relationship between a target and disease is established and if the target is druggable, then a screening campaign is initiated to search for potential therapeutic candidates. After a target is identified and validated, the next step is to interrogate many compounds (often millions) using high-throughput screens. This may include biochemical screens that measure the interactions and binding affinities between compounds and the target, as well as cell-based screens that assess the functional relationships of such interactions. CRISPR has improved cell-based screens by enabling scientists to more accurately generate cell lines with mutations relevant to the disease of interest. For instance, with CRISPR, multiple mutations can be induced simultaneously to better mimic disease genotypes. With better cellular models, these initial screens can accurately eliminate ineffective compounds and identify the most efficacious ones early in the drug discovery process, saving time and reducing cost. Hit molecules that pass this screening step are subject to more intense scrutiny in the next phase of the pipeline. Hits identified through the initial screens are validated through a variety of cell-based assays. CRISPR has profoundly impacted this stage of preclinical development by promoting the generation of models that accurately recapitulate diseases. Instead of being limited to immortalized cell lines, scientists can produce primary cells, stem cells, and organoids with appropriate cellular and genetic backgrounds. For instance, human induced pluripotent stem cells (hiPSCs) from people of diverse ethnicities and backgrounds can be used to produce nearly any cell type. From such stem cells, isogenic cell lines can be easily generated, and the genetic variation associated with a disease can be recreated through precise genome engineering. The ability to produce such realistic disease models has greatly enhanced the efficacy of hit validation, enabling potential drugs to be assessed more accurately. The validation of hits narrows the pool of candidates to just a few leads. At this point, the remaining compounds are optimized and tested for safety. This includes characterizing absorption, distribution, metabolism, and excretion (ADME); assessing chemical stability; and evaluating toxicity. CRISPR has accelerated progress in this phase by enabling the generation of cellular and animal models used to test the efficacy and safety of candidates. For instance, mouse models with multiple mutations can now be generated in one step by directly editing zygotes instead of crossing single-mutant animals. Moreover, CRISPR will likely enable a wider range of animal models to be generated. Following optimization and safety testing, the few remaining candidate compounds proceed to clinical trials. Only drug candidates that prove to be safe and effective in humans are finally evaluated by the FDA for approval. Information gathered from this phase often feeds back to preclinical development. For instance, if resistance to a compound is observed, then compounds that counteract the resistance can be explored in subsequent studies. CRISPR holds tremendous potential in advancing pharmacological research, with its impact spanning the entire preclinical drug discovery pipeline. Because CRISPR makes gene editing more tractable and precise, drug targets can be identified faster, and disease models can be generated that are more realistic. An increasing number of collaborations between industry and academia are sure to further advance the role of CRISPR in drug development. Pharmaceutical companies are also investing in CRISPR infrastructure to develop the next generation of drugs. In parallel, CRISPR is also being used to develop novel gene- and cell-based therapies that modulate genes directly within the patient or through ex vivo methods. For example, chimeric antigen receptor T (CAR-T) cells are being engineered to target cancer. CRISPR not only holds promise for developing therapies faster and at lower cost, but also facilitates the advancement of personalized medicine. Soon, the tailoring of therapies to individual patients may no longer be just an idea, but a distinct reality. Brittany L. Enzmann, PhD, (brittany.enzmann@synthego.com) is a scientific communications manager and Ania Wronski, PhD, is an engineered cells product manager at Synthego.